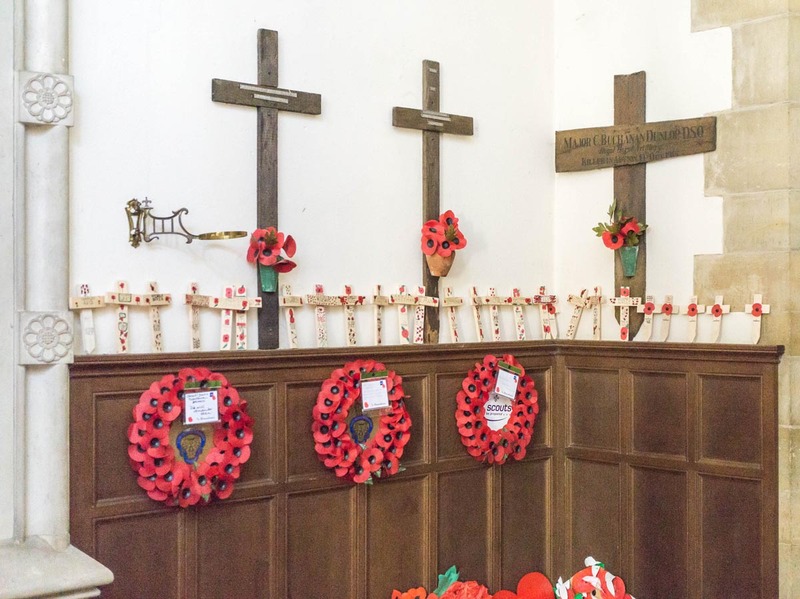 Location: There are 5 crosses commemorated at St Leonards, Turners Hill. 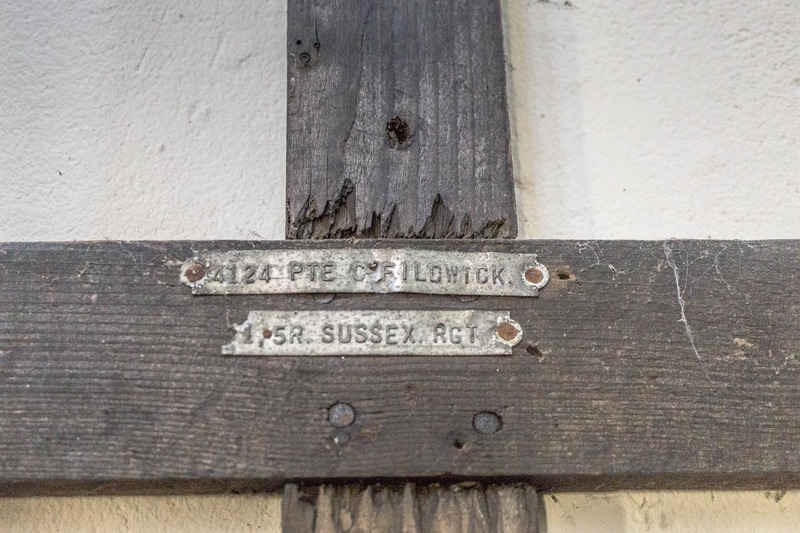 They are located on a wall at the back of the church (through a wooden door) underneath the bell tower. Each cross has a small pot attached filled with several poppies, and there are also poppy wreathes, a poem, and small crosses adorning the walls. 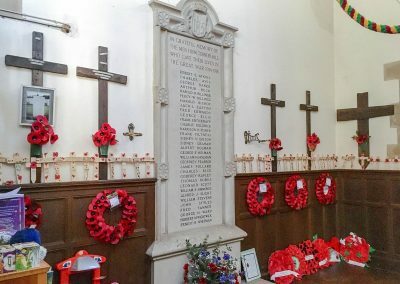 The following men are remembered here (left to right) – Charlie Fieldwick, Alfred James Slight, William Godfrey Rapley, Ernest Richard Whitman, and Colin Napier Buchanan Dunlop. 15R SUSSEX RCT – (partially broken). Text type (e.g. hand-written, GRU tags, carved): 3 GRU tags only. Mounting to wall: The cross is mounted to the wall by screws. Detailing: No other details on the cross, but a framed photograph of the headstone of Private Fildwick in Hamel Military Cemetery has also been attached. Evidence of use in field (earth marking, cracking, staining, shrinkage): There is minor staining to the bottom of the cross which suggests evidence of use in the ground. 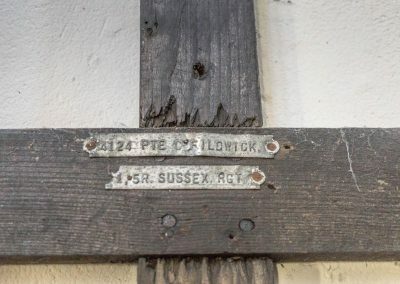 Condition (cracked, paint peeling, woodwork, damage etc): The cross has some cracks, especially just above the cross member. There is also a small hole just above the cross member. 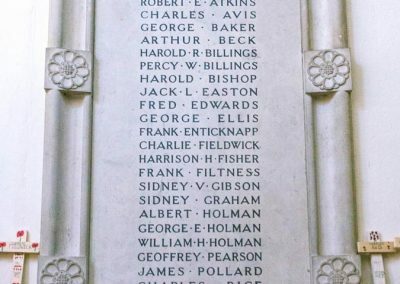 Private C.Fieldwick – Charlie Fieldwick was born in Turners Hill in 1897, the 4th child of William & Florence Fieldwick. 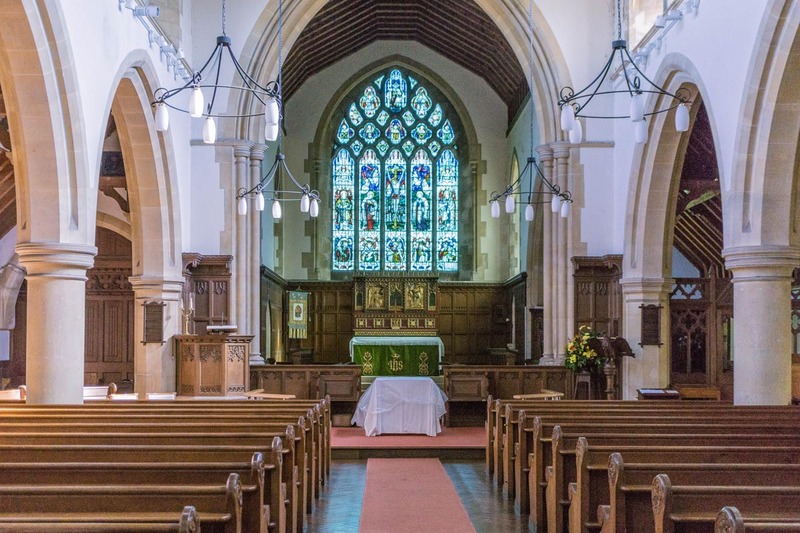 He was a house decorator and also built their house ‘Little Miswells’. 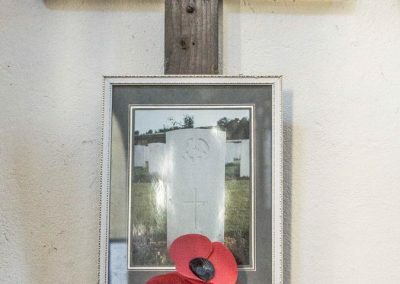 Charlie was killed in action 3rd September 1916 and is buried in Hamel Military Cemetery at Beaumont Hamel on the Somme (Grave Ref II.A.29). He was aged 19. 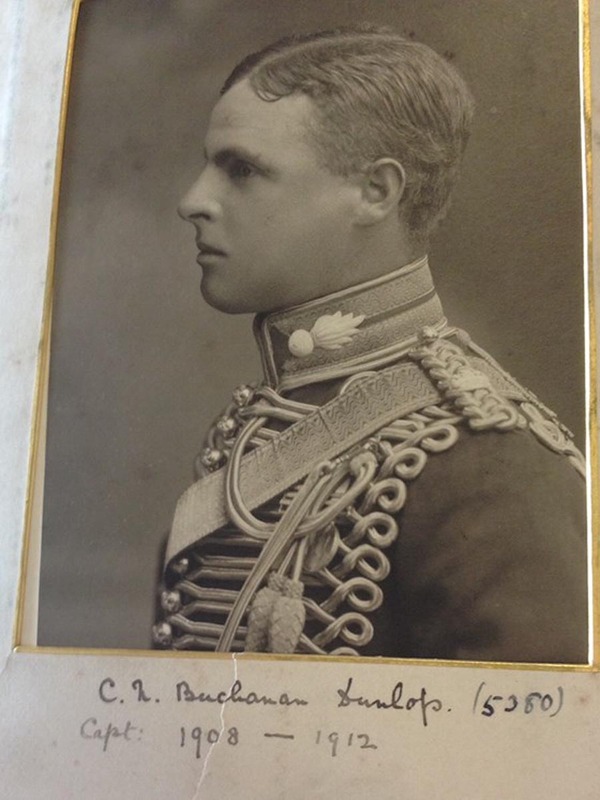 He is one of 20 members of the regiment that lost their lives in the attack on Mesnil. Text type (e.g. hand-written, GRU tags, carved): 5 GRU tags only. Evidence of use in field (earth marking, cracking, staining, shrinkage): No evidence of use in the ground. Surface insertion depth (into ground if apparent): Not apparent. Finish (varnish, paint, oiled, unfinished etc): Rough unfinished dark wood. Condition (cracked, paint peeling, woodwork, damage etc): Two cracks in the cross member, but overall very good condition. Guardsman A.J.Slight – Alfred James Slight was born in Ore near Hastings. He was the son of Alfred & Ann Slight. He was killed in action on 25th January 1915 and is buried at Woburn Abbey Cemetery, Cuinchy (Grave ref II.C.15). He was aged 23. Text type (e.g. hand-written, GRU tags, carved): 2 GRU tags only. Condition (cracked, paint peeling, woodwork, damage etc): Overall very good condition. 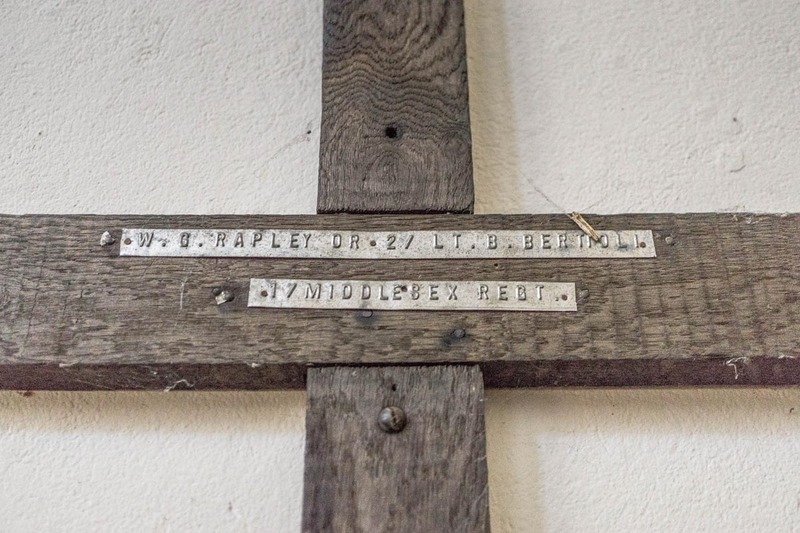 2nd Lieutenant W.G.Rapley – 2nd Lieutenant William Godfrey Rapley was born in Crawley in 1894 – the son of Edwin & Leonora Rapley. 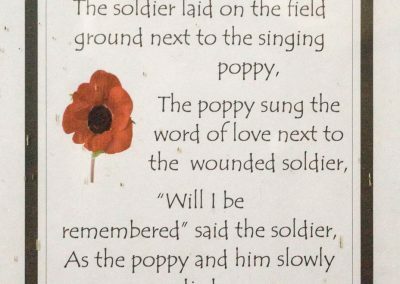 He was seriously wounded and died on 25th September 1917 aged 23. 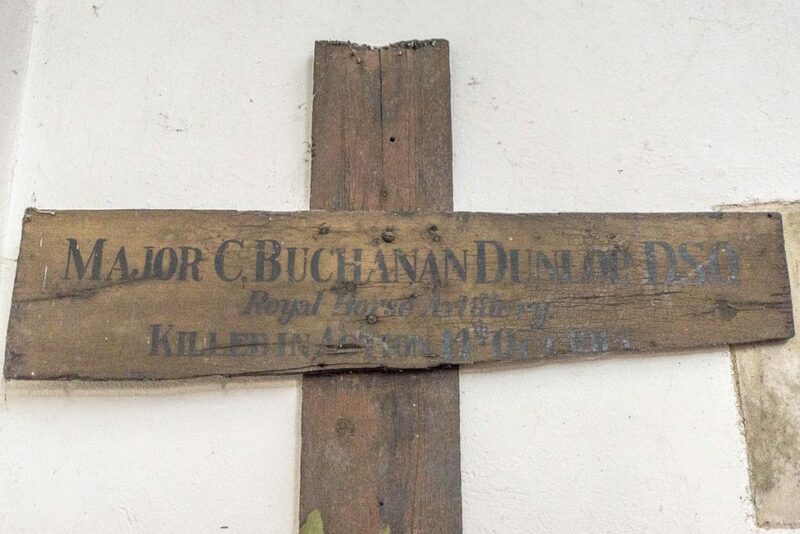 He was buried at St Julien Dressing Station Cemetery (Grave ref IV.D.10). Evidence of use in field (earth marking, cracking, staining, shrinkage): The bottom of the cross is very cracked and discoloured, there is a lot of evidence of use in the ground. Surface insertion depth (into ground if apparent): A depth of 254mm. 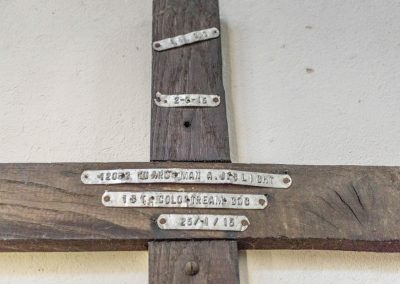 Condition (cracked, paint peeling, woodwork, damage etc): There is a small hole just above the cross member, and the cross is very cracked and worn at the bottom. Other than that it’s in good condition. Gunner E.R.Whitman – Ernest Richard Whitman was born in Worth, and was the son of Noah & Agnes Whitman. 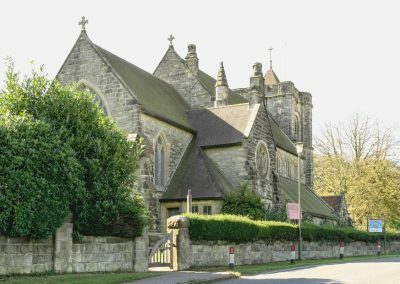 His father Noah was the first verger of St. Leonards when it was consecrated in 1895. He was married to Grace. 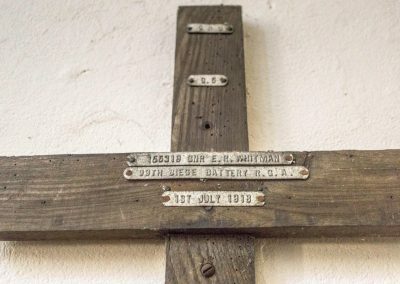 He died of his wounds on 1st July 1918 and is buried in Aire Communal Cemetery, France after being gassed (Grave ref III.G.5). 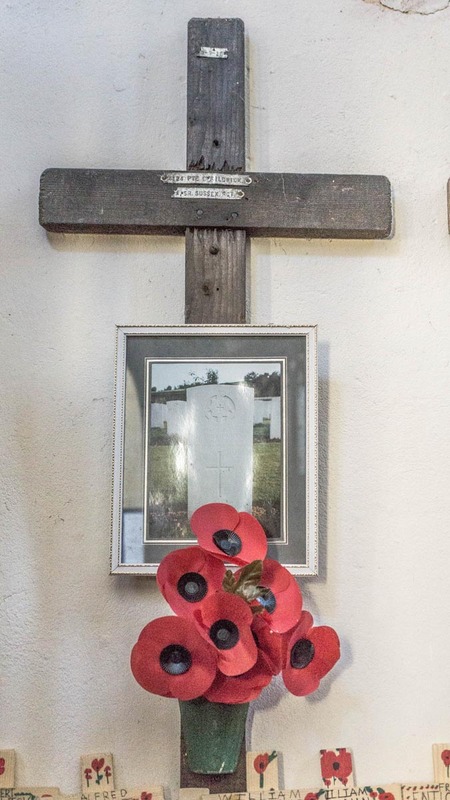 He is also commemorated on the Crawley Down memorial. Text type (e.g. hand-written, GRU tags, carved): Hand painted in black text. Surface insertion depth (into ground if apparent): Depth of 304.8mm. 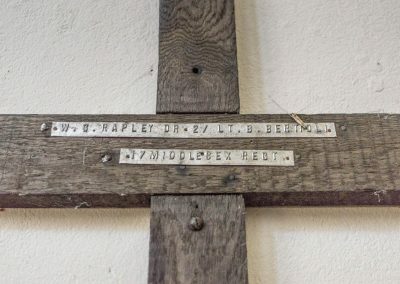 Condition (cracked, paint peeling, woodwork, damage etc): The cross is made of very rough wood and part of the cross member has broken away on the right hand side. 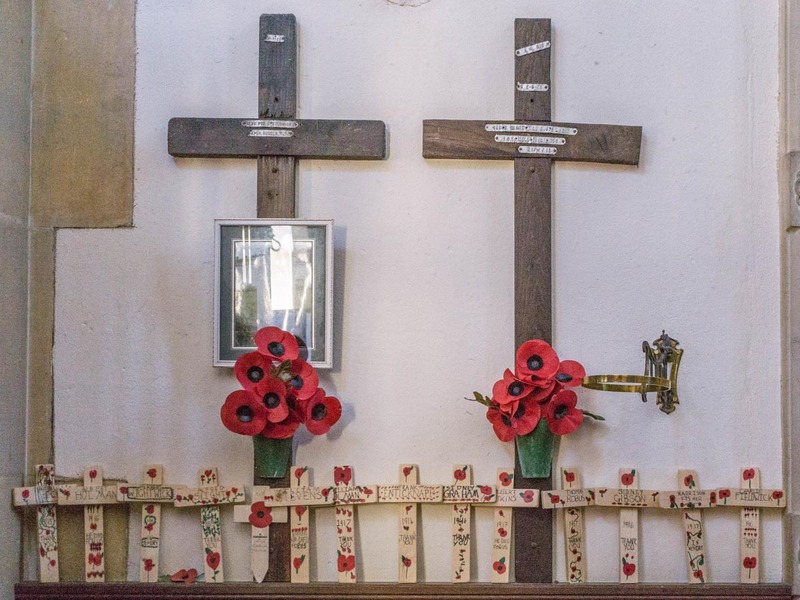 It is very different in size and shape to the other crosses. 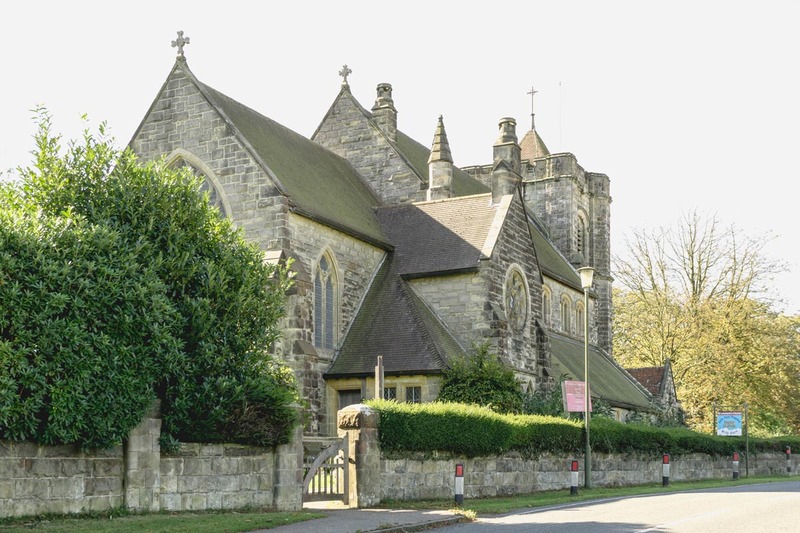 Major Buchanan Dunlop – Major Colin Napier Buchanan Dunlop was the brother of the vicar of St Leonards church during the Great War. 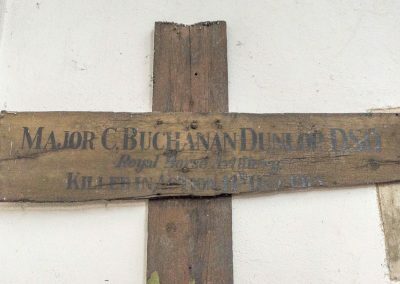 He was the son of Lt. Col. Henry Donald Buchanan Dunlop. 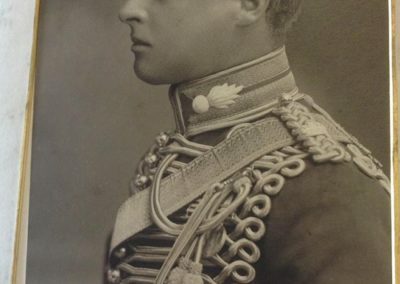 He was promoted to Major in 1913. In June 1915 he was also awarded the Distinguished Service Order. 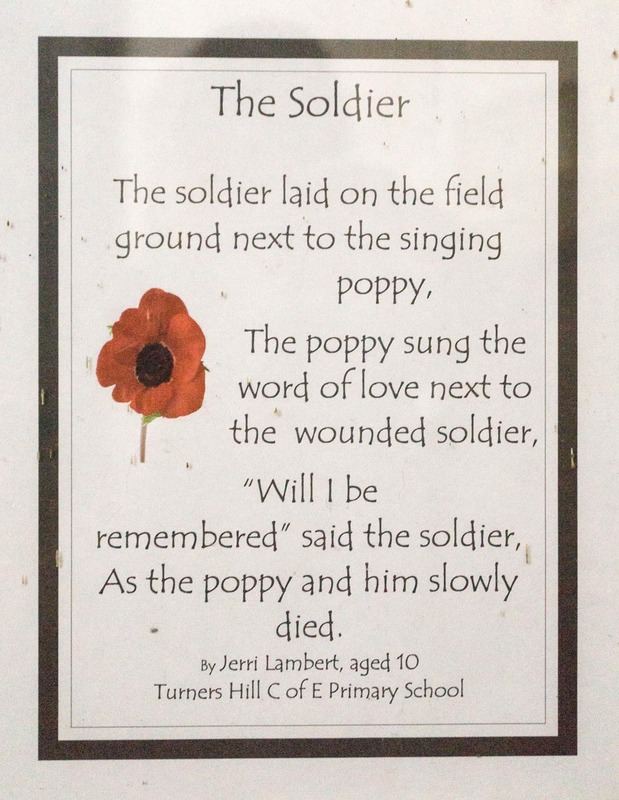 He was killed while sleeping by a German shell that exploded in his billet on 14th October 1915 and is buried at Vermelles British Cemetery (Grave ref I.G.12). He was aged 38. 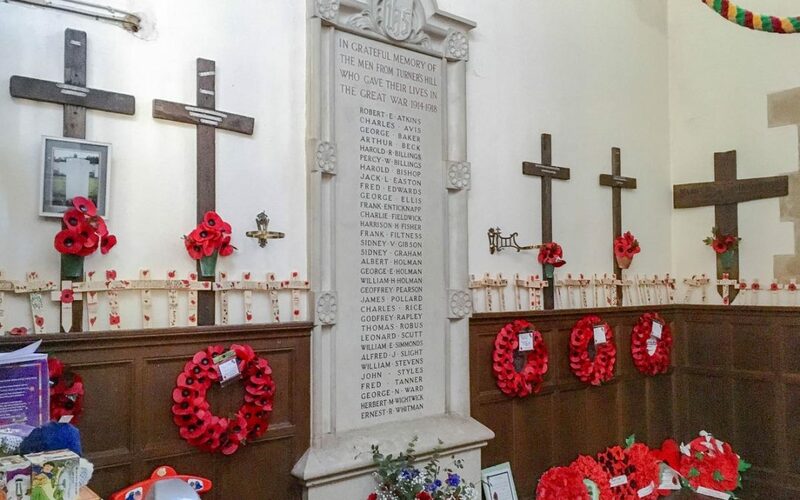 Between the 5 crosses there is also a large marble tablet which commemorates the lives of the other soldiers lost during the Great War. 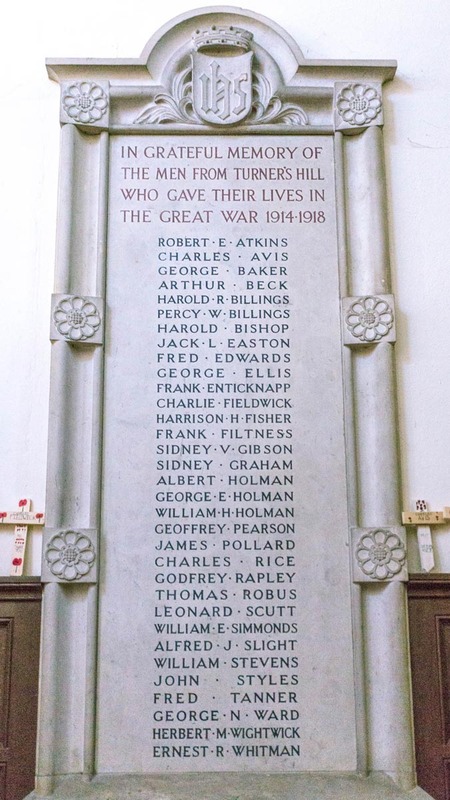 It states ‘In grateful memory of the men from Turners Hill who gave their lives in the Great War 1914-1918’. 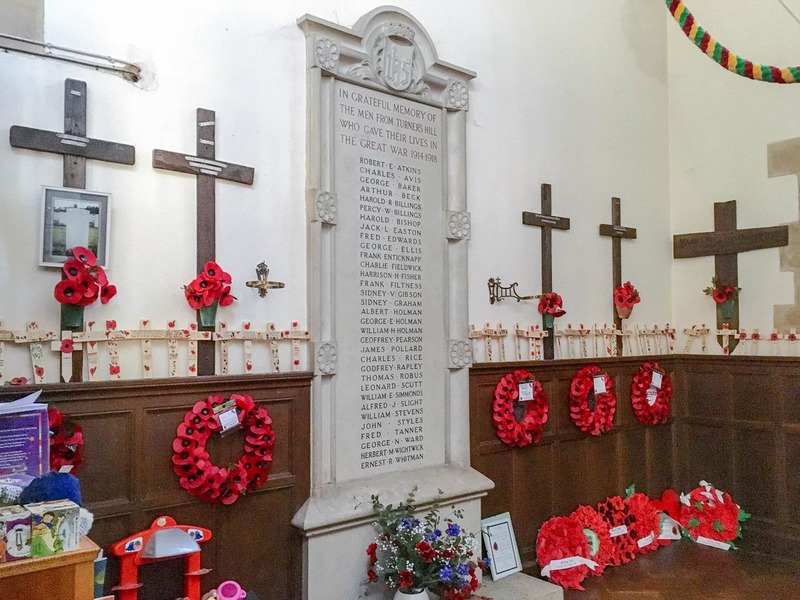 There are 33 names on the tablet, including the names of the 5 soldiers also commemorated on the crosses. 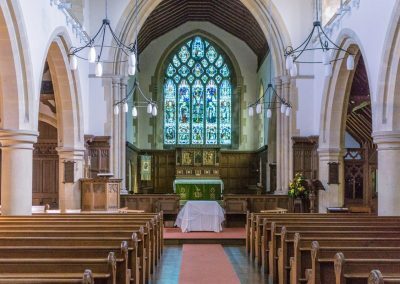 St Leonards Church is open daily to the public.